These are the items I bought to create this look…each only $1!! To create the table setting, start with putting together the “accessories” for the table starting with the pillar candles. I used the red kidney beans to provide warmth in the Glass Cylinder Vases, 9 in. and the votives but you could also use white beans or corn kernels. All you need to do is put the candle in the vase first and then pour the beans into the vase and voila!! Same with the candle votives … add the beans to the votives and then top it off with the candle. Next, start putting together the centerpiece. First, fill the Glass Cylinder Vases with the white beans to help hold up the stems. the longer sprigs into the center of the vase and builds outward. Be sure to “fluff” each spray to provide fullness as you go. After the taller pieces were installed, I added in the feather components and then finished with faux hydrangeas. You will need to use wire cutters (click here for a suggestion) to cut the individual stems off the bunch so that they can be more easily placed into the arrangement. And here is the end result!! Lastly, add the placemats, plates, bowls, the candle accessories and the adorable leaf plates. So cute! 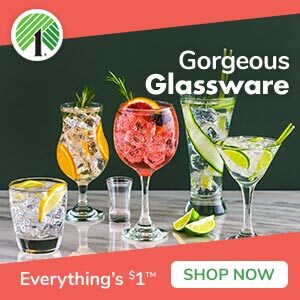 I absolutely flipped for the green glass wine glasses that were only $1! I went ahead and purchased 4 more to use them on my main Thanksgiving table setting (blog post coming soon on that topic). 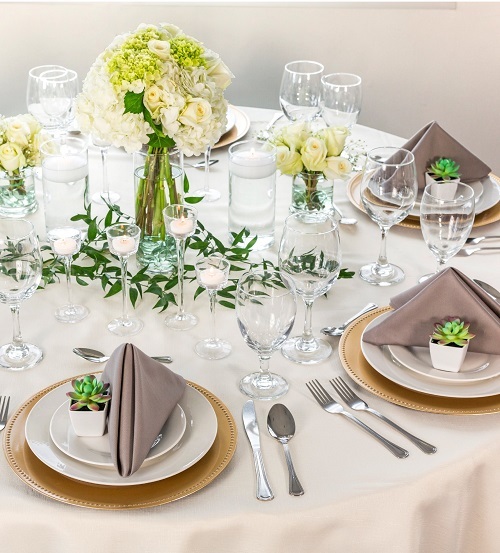 Hopefully, this inspires you that you can create a beautiful table setting for less than $50!! You cannot beat that! Prepare your favorite Red Beans and Rice rice recipe. Click here for a great recipe! It is a great time of year to make a big pot of Chili! Try this unique recipe for an Easy White Bean Chicken Chili … Click here! How about a dip? This is a great, easy Roasted Red Pepper Bean Dip to try. It is vegan, gluten-free and low carb! Click here! 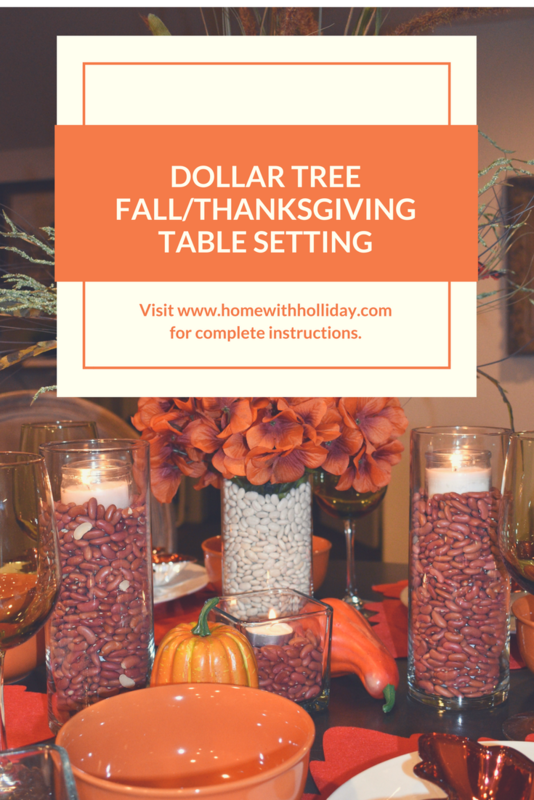 Thank you for stopping by to see how I put together this Dollar Tree Fall/Thanksgiving Table Setting. It was super easy and inexpensive! Please share your comments below and consider subscribing to my blog to receive instant notifications (free) of new posts.